A 23-year-old man developed sudden onset of fever and headache. He was alert but had slight difficulty with naming and had agraphia and acalculia. The provisional diagnosis was viral encephalitis. MRI showed a left posterior temporal hemorrhagic infarct with thrombosis of left vein of Labbe (figure 1). This was confirmed by MR venography (figure 1, D, E) and digital subtraction angiography (figure 2). Isolated thrombosis of the vein of Labbe has been rarely reported. The left Labbe vein has been most often involved.1 The vein of Labbe drains the lateral temporal lobe and empties into the transverse sinus.1,2 Thrombosis can cause temporal lobe hemorrhagic infarction, hemorrhage, or edema. Figure 1. 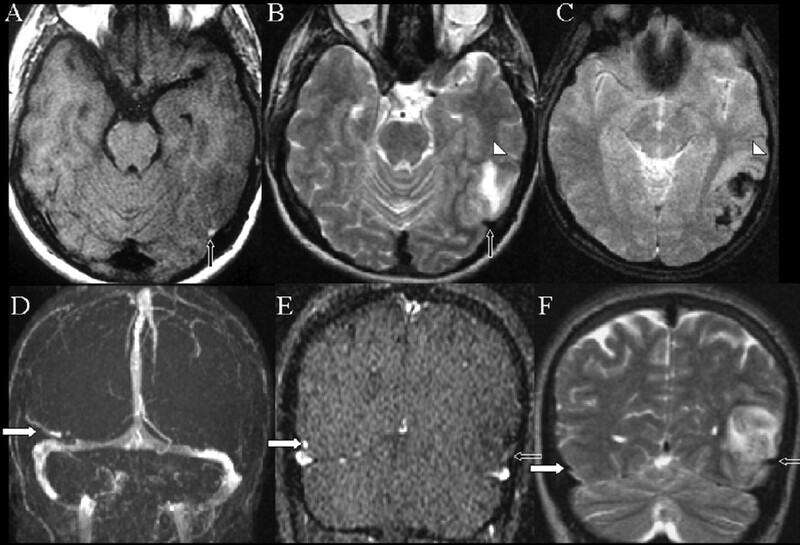 MRI and MR venography: T1-weighted axial spin echo imaging (A); T2-weighted axial fast spin echo imaging (B); T2*-weighted axial gradient-recalled echo imaging (C); two-dimensional time-of-flight MR venography (D); coronal source image of MR venography (E); T2-weighted coronal fast spin echo imaging (F). Note the hemorrhagic venous infarct in the left posterior temporal lobe (arrowhead). Vein of Labbe is patent on the right side (filled arrow) and occluded on the left side. The thrombus in the vein appears hyperintense on T1 and hypointense on T2-weighted images with absent bright signal on time-of-flight source image (open arrow). Figure 2. Digital subtraction angiography, venous phase. (A, C) Right carotid injection; (B, D) left carotid injection, lateral and anteroposterior projections. Note the vein of Labbe is not opacified on the left side. 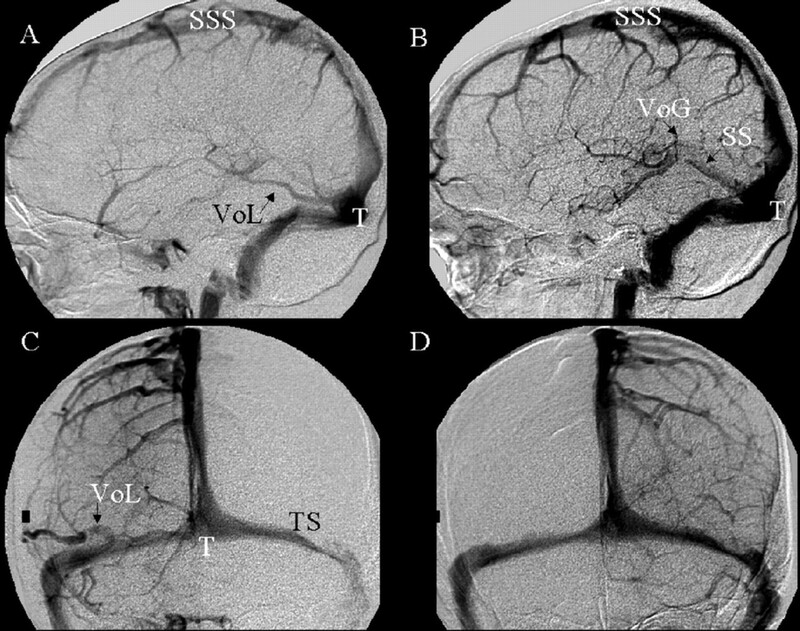 SSS = superior sagittal sinus; SS = straight sinus; T= torcula; TS = transverse sinus; VoL = vein of Labbe; VoG = vein of Galen.